"Leveling" is one way to get rid of the dirt in the black and white areas. Most scans that come to you will look like a gray film is pasted on top of them. I recommend leveling before the image is resized -- in some cases, this can make the world of difference as to how the image comes out. 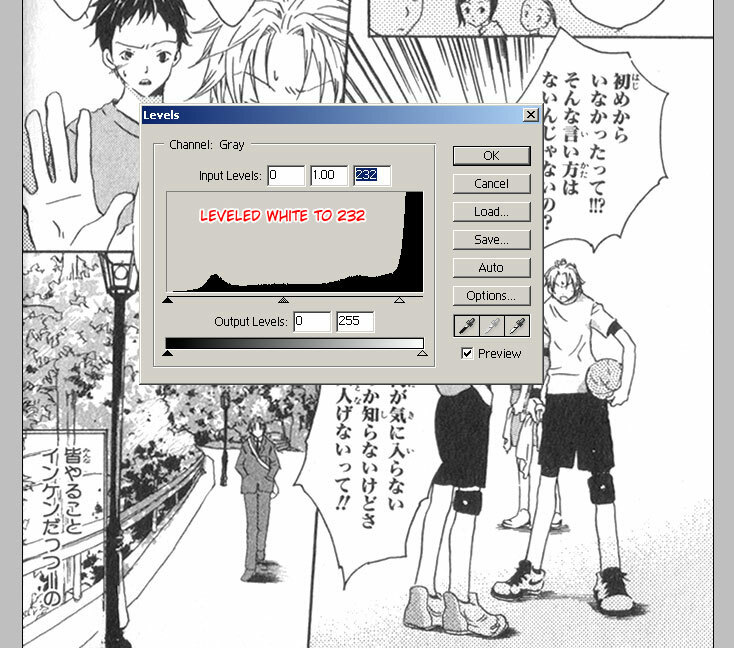 To level an image, open the leveling box by going to Menu Bar>Image>Adjustments>Levels... or simply using the shortcut ctrl+L. See how it looks burnt? And the midtones on the shirt, the ground, the trees, and just about everywhere have lightened and look choppy? This is an extreme, obvious example of over-leveling. In order to avoid any over-leveling, I recommend that you level just until the areas are free of dirt. 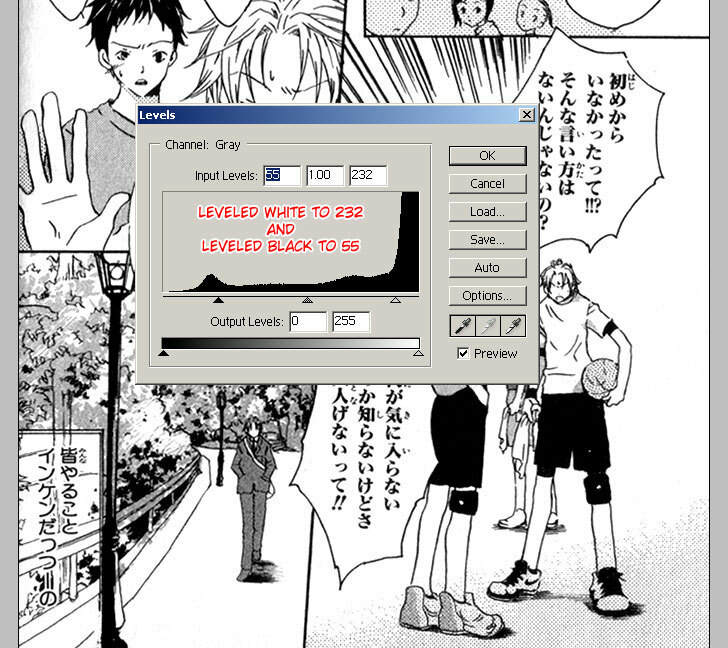 If you're worried about overleveling an image, there's always the option to create an adjustment layer which will level the layer(s) below it. To do this, at the bottom of the Layers pallete, choose "Create new fill or adjustment layer" -> "Levels...". You'll then be prompted with your standard levels box. Once you set the levels, a new layer will appear in the pallete, and all layers below it will be leveled to the specifications you entered. 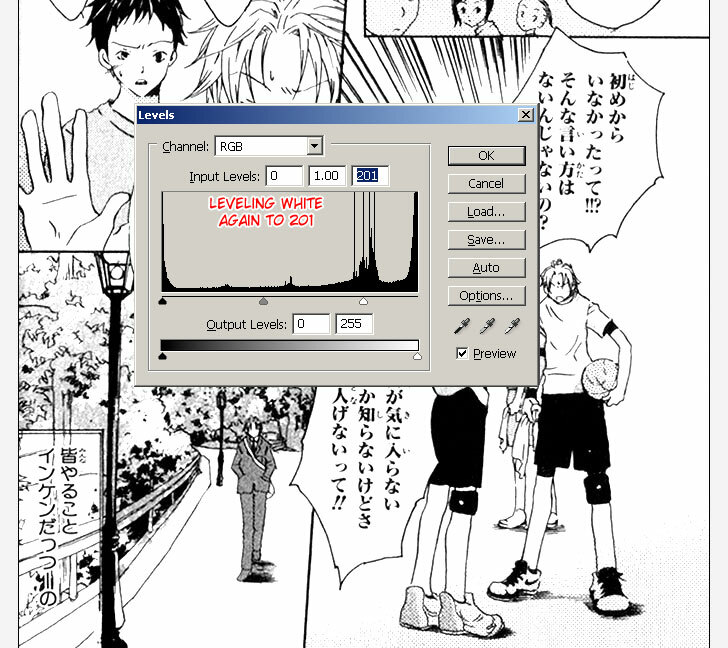 Double-clicking the layer thumbnail on the adjustment layer allows you to change the levels at any time (see all this). Be careful to put all the text layers above the levels layer, or they'll be leveled and look choppy. That takes care of levels. Read on to see how to get rid of that pesky gutter shadow.